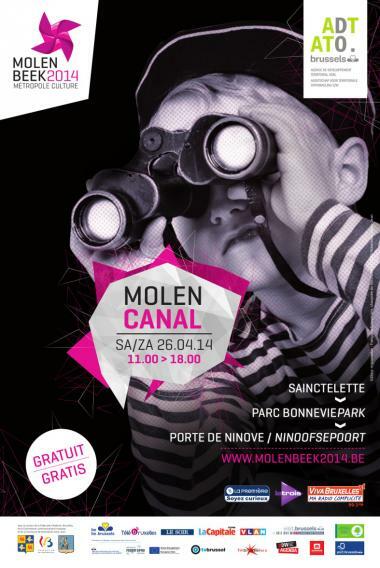 2014-04-16 – Following ‘MolenStart’ and ‘MolenDance’, here is another landmark event in ‘Molenbeek, Capital of Culture 2014’: ‘MolenCanal’, organised with the support of the Urban Development Agency, will take place on Saturday 26 April from 11 am to 5.30 pm. a world tightrope-walking record attempt above the Canal. street shows: La Fleur d’Eau (a 20-metre floating marionette that will make playful use of the dynamic qualities of air, water and earth); the ‘Soumonces’ festivities before the Zinneke Parade; acrobatics on fabric stretched above the water; closing show with Sysmo Game (6 pm, Rue Sainte-Marie: you are invited to make the earth move under your feet during an urban collective performance, both at ground level and on balconies made ​​available by local people), concerts, and much more. special routes you can discover through the municipality (on themes such as urban regeneration, the conversion of the Belle-Vue site,the mysterious waters of Molenbeek, etc.). exhibitions (The Blue Magic of Chefchaouen; video and digital art: iMAL; etc.). refreshments to suit all tastes (barbecue, food trucks, etc.). Bonnevie district festival (in the park, which will be transformed into, among other things, a kid’s village). 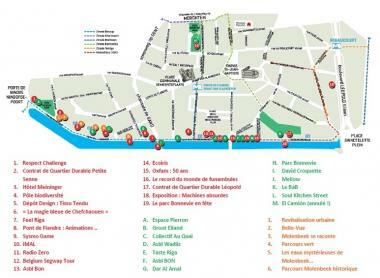 MolenCanal - Saturday 26 April - Sainctelette > Parc Bonnevie > Porte de Ninove - Free entry.